If you’re a tea lover, I have a treat and a tea to introduce to you: Plum Deluxe Tea! Plum Deluxe’s line of signature loose leaf teas are designed to help you to slow down for a mindful moment and enjoy the luxurious feeling of a cup of tea, perfect for a warm exchange with friends and family or a few quiet minutes of reflection in solitude. Hand blended and infused with love in Portland, Oregon, all Plum Deluxe tea blends are organic, non-GMO, and free of chemicals and sulfites. One needs a touch of caffeine to keep the conversation flowing, the pages turning, or the pen on the move, so we start this blend with a wonderful cream black tea. We then added rosebuds for creativity and sustenance, lavender for flavor and aroma, and top it off with a bit of chamomile which adds a calming balance to it all. Use 1 1/2 tsp per 16 oz cup. Steep with boiling water for 3-5 minutes. Because Plum Deluxe uses the freshest ingredients, you can steep your tea twice for a second cup. I need a little caffeine in the afternoon as a pick-me-up and this just my cup of tea ;) with a wonderful fragrance! It was love at first sip for me, and a the feeling of indulging in a cup of something special! The apricot + lavender “Vista Blend” is inspired by one of our favorite things about nature — the views. This tea reminds us that we can have a beautiful view wherever we are, if only we slow down to appreciate it. We use a base of earthy honeybush tea, paired perfectly with Oregon lavender and apricot essence. The fruit and floral pair to create a calming influence. It’s just delightful — and especially refreshing on ice. Originally this tea was a seasonal-only blend, but based on your demands we’ve elevated it to a signature blend so you can get your Vista cuppa any time of year. Ingredients: Honeybush Tea, Apricots, Oregon Lavender, Apple Pieces, Sunflower Petals, (mine had Marigold petals) Natural Apricot Essence, Love, Gratitude. No caffeine. Preparation Instructions: Use 1 tsp per 16 oz cup. Steep in boiling water 3-5 min. Cold brew for the best iced tea. I’m a fan of peach and apricot flavors in tea so I knew I would enjoy the Vista Blend. It is fragrant and sweet without the need for sweetener. I’m looking forward to trying this refreshing blend iced in warm weather! Sometimes you need a bold black tea to help you clear through the emotional and mental clutter and help you focus on what you need to do to reach your goals and dreams. That’s the intention with our “Fog Cutter” Irish breakfast blend with a hint of lemon. It’s got all of our favorite black teas — Darjeeling, African, Ceylon, and Assam — along with a hint of lemon peel to provide brightness. Expertly blended, you’ll love it hot or iced, steeped strong or weak, with or without your favorite extras. Sail ahead, brave one, and clear skies are ahead! Ingredients: Assam Black Tea, Ceylon Black Tea, African Black Tea, Darjeeling Black Tea, Lemon Peel, Love, Gratitude. Has caffeine. Preparation Instructions: Steep 1 tsp in 8oz boiling water 3-6 min. Fog Cutter Black Tea is a coffee lover’s tea blend and ideal for a first cup in the morning! I pulled together some teatime treats from the archives for you to sample with your tea! Click on the links for the complete post or recipe. Easy and fun to make! Make the flower tart shells in advance, store in an airtight container and serve with an assortment of sweet or savory fillings at teatime! Easy and beautiful with edible flowers and herbs that adds a ‘wow’ factor for a shower, garden club lunch or tea! Pound Cake Tea Sandwiches are finger sandwiches of cake, filled with layers of chocolate buttercream and strawberry-cream cheese. Enjoy these as a no-bake teatime treat using store-bought ingredients, as easy to make and as they are to eat! You find all of Plum Deluxe Tea blends including Black, Green, Chai, Oolong, Herbal and Puerh, HERE. Prepare to be wowed by all the varieties available! To help you get acquainted with Plum Deluxe, they’re offering a promo code to HIWTBI readers. Use the VIP promo code BOAT on the cart page before checkout to receive 12% off your purchase, or join Plum Deluxe tea club (just $10/month) and receive 20% coupon plus free shipping for any accessories or teas. Code is valid through 4/30/18. Thank you to Plum Deluxe for introducing me to your wonderful teas and providing me samples for this review. Great Post! thank you and have a nice Easter! Mary what a beautiful post!! I love tea and am excited to learn about Plum Deluxe. My husband has recently started drinking decaf tea and I’m looking for something he can enjoy other than Camomile. Looking at all your photos makes me want to have a tea party and now that Spring is just about here in the Northeast (hopefully) it will be something to look forward to. Have a Blessed Easter Mary. So enjoyed your post. Everything is beautiful! You might convince me to start drinking hot tea again :) Your treats look amazing! This post takes me back to a wonderful time long, long ago. The Sunday Afternoon Teas at my Gram’s house is one of my most favorite childhood memories. Using her beautiful and delicate assorted fine Bone China teacups, taking turns “pouring” and serving tea sandwiches/pastries was a delight beyond measure to this young girl. The tea was always a loose blend steeped in her china teapots. Tea time has been carried on with my own children whilst they grew up. It is still a lovely part of my day spent with my youngest daughter when she returns from work to pick up my sweet Grandson. There is nothing that can not be solved over a cup of tea, at least for us. Thank-you so very much for sharing your new treasure. Now, please excuse me as I must go shopping for TEA!! What a beautiful post and so encouraging to take time to reflect, and enjoy the simple things. I loved what the son said, how precious! As I am not a coffee drinker, I do like a good come of tea now and then, and this tea may turn me into a full time tea drinker. 😃 Your tea cups are lovely and all the sandwiches and treats look so yummy. 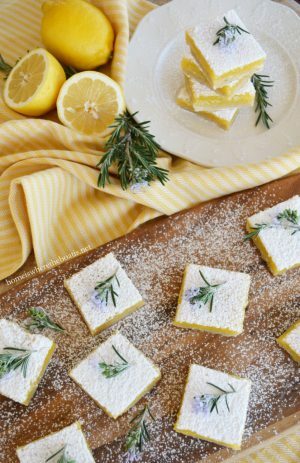 Those lemon bars are calling my name. Thank you Mary, this is just what we need to welcome Spring! Happy Easter! I have never been much of a tea drinker Mary, but you make it sound very irresistible, especially paired with one of your lovely treats! I would love to get in the habit of taking a few minutes every afternoon to sit and reflect over a cup of tea, thank you for sharing your sweet thoughts and delicious sounding teas! Mary, I’m happy to discover this tea and the Reading Nook Tea Blend sounds like something I would love! Thanks for all the yummy teatime recipes and promo code! Beautiful tea cups. I never tried tea, but I think I just might! Really lovely! I drink tea day in day out, Hot to tepid, sometimes iced. Tea Tea TEA! 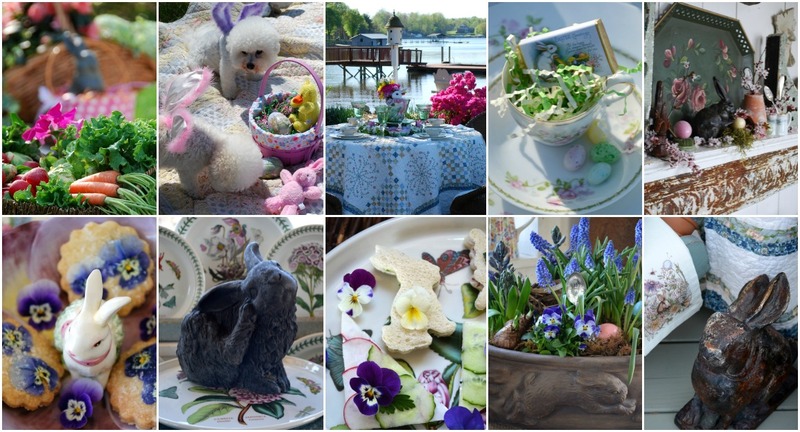 And all the gorgeous flowers on linens and on charming china tea cups make me smile. I’m raising my favorite plaid mug o’ tea right now! Huzzah fellow tea drinkers! I join all the others in telling you what a beautiful post this is. I wonder where you got the “M” cup. Thank you, also, for all your extraordinary posts that bring inspiration and joy every time. have a blessed and happy Easter, Mary! Oh, goodness. Just what I need — another place to buy tea!!!! Thanks for the introduction to Plum Delux. I already have them bookmarked. Oh, my …..
Hi, I guess I should get a finders fee for putting a Home is where the boat is on a facebook post for Plum Delux! LOL I love their teas and have been a member for awhile. I loved the tea snacks you posted too! Happy Easter and Happy Spring! Hugs to all! This is such a lovely post! I could get lost admiring your beautiful china patterns. And thank you for introducing me to this wonderful tea company. I enjoy all your beautiful posts and all the subjects you post about….gardening, flowers, food, tablescapes, dishes, pets, holidays, travel, etc. But anything “tea” is a favorite!! Oh my Mary, I loved reading this post and learning about Plum Delux Tea. The flavors sound so appealing to me, a tea drinker. 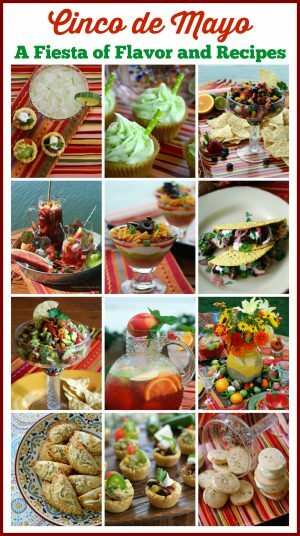 I pinned so many of your photos to my Tea Party Pinterest board. Thank you, as always! Love the teacups. I need to try some of this tea. Have a lovely Easter. Such a beautiful post!, Craving a tea party! All of the beautiful cups and beautiful tea sandwiches and treats – something magical about tiny, beautiful foods! You always make life beautiful!! Mary….you have made me smile from ear to ear!…Oh those cups, and the tea sandwiches and the tea that sounds amazing….especially the Rose/Lavender/Chamomile….and most of all, I love your mother’s philosophy on life…it truly stops you in your tracks and makes you think what life is all about….she had it so right!!! This is beautiful. I love tea. It is something I’m sharing with my nieces. Your tea cups are lovely. Can you give me an idea where to start a collection. I would be so grateful. I’d like to give each of my nieces a set. Ordering some Vista blend and making your tars and spring tea sandwiches for our next party. 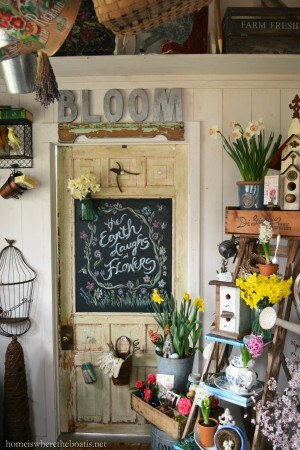 So many gorgeous ideas, here!! Thank you for sharing with fellow tea enthusiasts! 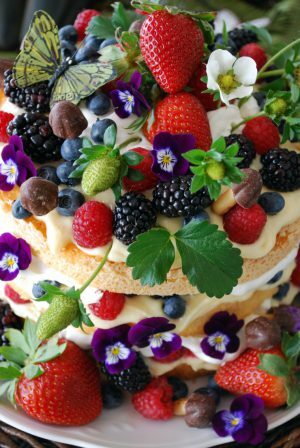 Another gorgeous post…I was licking my lips looking at those scrumptious sandwiches…and I have to do some of those tart shells. Thanks for posting this eye and tummy treat of a post! I love getting your blogs in my email! The photography is so beautiful and you inspire me to set a beautiful table. I must have missed this post when it came out but noticed it in the sidebar. I have inherited a collection of miscellaneous china cups from my mother who gave me a love for tea. After a trip to Scotland this past fall I have decided to use these rather than let them sit in the cupboard being ‘to pretty to use’. So I am starting to have afternoon tea with my young granddaughter. The lemon pastry tarts you made also remind me of my mother who faithfully made them each Christmas…tho hers weren’t so pretty. Do you know where I can find a flower cookie cutter like you used? The ones I see are more scalloped and less petal shaped. Or if they are petal shaped they are much smaller. Any suggestions would be much appreciated. Thank you for sharing your garden and all your inspiration! Thank you Nancy! Afternoon tea with your granddaughter using your pretty cups sounds like a wonderful tradition! I don’t remember where I found mine but I just did a quick Google search and saw Bed, Bath & Beyond has a 6-Piece Flower Cookie Cutter Set, HERE. Thank you so much Mary! Have a blessed day. Thank you for the inspiration! I’m having my quilting friendship group over next week and decided to have a Tea! It’s a wonderful way to entertain, my favorite. I drink tea almost all day and especially at tea time, half past four. Think I will make the lemon bars, chocolate covered strawberries, mini scones, lemon curd, strawberry jam, and clotted cream, plus mini cream puffs filled with chicken salad and egg salad sandwiches cut in triangles of course. How does that sound? Wish you could join us! My “bide-a-wee” is Scottish, and I am half German and half English, Irish, Scots, Welsh. So happy to find your lovely site!